Real Madrid bade a fond farewell to Al Kass 2018 with a convincing 4-0 victory over fellow giants of European game AC Milan. The Spaniards had taken a shock exit from the knockout stage after falling victim to a smash-and-grab raid by Kashiwa Reysol in the quarter-finals, and seemed determine to demonstrate their true pedigree this tie round. Indeed, Real were almost in front with the game’s very first attack, with Alex Mendoza running clear through the middle, only for a last-ditch tackle to check his progress as he shaped to round keeper Niccolo’ Zanellato. On 10 minutes, the Milan stopper again had to be alert to keep out a first-time snapshot from Mendoza, as the two technically accomplished sides went head to head in a thoroughly competitive encounter. But Zanellato was helpless to prevent his side from going behind on 16 minutes despite diving acrobatically to touch a flicked-on corner onto the post, as Javier Lancho was on hand to convert the rebound before the keeper could recover. Madrid were in the ascendancy, creating a succession of presentable chances as Milan struggled to gather momentum although, in a rare foray forward on 27 minutes, Daniel Maldini saw his decent effort from the left go just wide of the post. Despite having endured a rather disappointing campaign thus far at Al Kass 2018, culminating in a 6-0 hammering at the hands of the imperious Benfica, it was to Milan’s enormous credit that their players were giving their all in this match, with little more than pride to play for. In the finest Italian tradition, the Rossoneri’s defence was particularly well organised, providing a platform that allowed the team to grow into the game as half time approached. However, on 39 minutes, their steady progress was halted when Madrid launched a rapid counterattack. 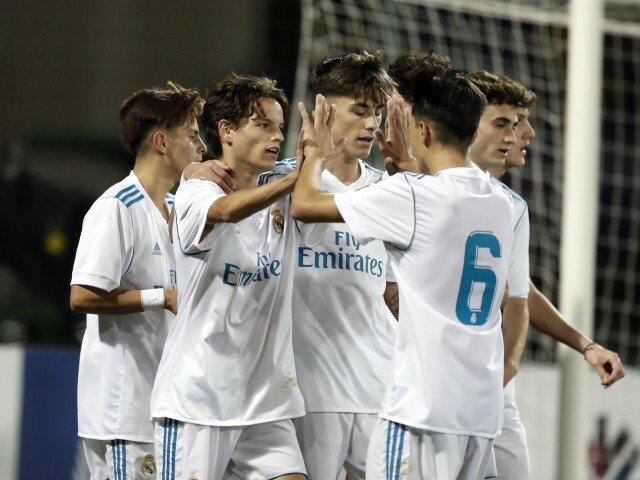 David Franco got to the byline on the left and cut the ball back for Jorge Ramirez to apply a straightforward finish and double Los Blancos’ lead. Madrid maintained their dominance as the second half got underway, and impressive centre back Sergio Santos was inches away from scoring a third with a ferocious strike from all of 30 yards that flew just wide. Milan’s life was made all the more difficult by Real’s highly disciplined approach, which ensured they had a minimum of eight players behind the ball whenever the Italians were in possession. In order to penetrate this formidable defensive unit, AC needed to commit numbers to attack but seemed reluctant to do so, with their forward players often isolated and unable to hold the ball up. With Madrid now looking comfortable, coach Manuel Fernandez withdrew captain Javier Diez on the hour mark, with Julio Escorcia slotting in at centre back as Los Blancos switched to a back three. Further forward, Real continued to fashion opportunities and, on 67 minutes, Cristian Garcia conjured a wonderful strike from wide on the left, his curling effort rattling the crossbar as Milan fought to hold back the tide. Their efforts were in vain, however, and on 72 minutes Real were three goals to the good when Garcia stole the ball from Tommaso Merletti inside the area and planted the ball through the keeper’s legs. Milan’s misery was compounded five minutes later when Madrid won a free kick wide on the right. Substitute Alvaro De Frias swung in a high cross which keeper Zanellato rose to claim, only for the ball to somehow slip through his fingers and into the net. The goal encapsulated AC’s poor fortune throughout a tournament where results have not matched the side’s potential. Madrid, meanwhile, will rue the late goal conceded against Reysol last time out, as they again showed that they are a team with all the necessary attributes to have triumphed at Al Kass.